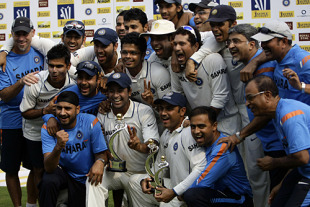 It was just in the 8th over after the game resumed on Sunday that Team India went to the top in the ICC Test rankings. As continuation to Aditya’s post, India won the match and the series at the historic Brabourne Stadium, Mumbai against Sri Lanka making India top the ICC Test Ranking in history! The play resumed on Sunday being candy in India’s pocket, India just required 4 wickets without allowing Sri Lanka 59 runs to mark the win. Just allowing 35 runs, India bagged 4 wickets and made their day, rather year! A confident Dhoni and his men kept tact from the first test match itself at Ahmedabad, which was drawn. In the second test match at Kanpur, India had a big win marking Gambhir, Sehwag and Dravid’s ton, making the series 1-0. Now with Sunday’s win, India won the series 2-0 marking Sehwag’s double ton. He missed a triple ton (and a record) just by 7 runs. Nevertheless, he is the man-of-the-match and the man-of-the-series. Even with Jayawardene’s double ton in the Ahmedabad Test, Indians managed a draw. India had managed to stay on top in ODI ranking for less than 24 hours with a win in Compaq Cup. South Africa won a match against England which made India slip to No.2. Event this position melted and India slipped back to No.3 when India lost the series to Australia, who took over the top position fron No.3. But the case of Test Matches is different. For India to lead the board, they need to keep the aim in their mind to play good. A forthcoming series India in Bangladesh is coming up in January 2010. India needs to show to the world that they can be No.1 for a long time. Dhoni has been marked India’s most succesful skipper now. He is yet to lose a match as skipper in Tests. India overall played 10 matches with Dhoni as skipper and won seven with three draws.